What do the major party candidates think about science? Much is being made of the qualifications of the Republican pick for vice-president, or the relative lack thereof. In the area of science, the only statements in the media reflect Palin's credentials as a conservative Christian who is a creationist, who believes that creationism (or the barely-disguised intelligent design) should be taught in public classrooms. Defenders say that her apparently single public comment has been taken out of context (so out of fairness I link to a site I rarely agree with, here). Other reports detail her belief that global warming is not caused by humans, and that polar bears are not threatened, and therefore do not deserve protection under the Endangered Species Act. It is a bit harder to pin down McCain's policy on creationism; he has been quoted on both sides of the issue, and he spoke last year at the Discovery Institute, the source of intelligent design "theory". Science should be a critical issue in this election. Many of our most pressing national issues require a clear understanding of how science works, and how we as a country must respond: global warming, science education, energy issues, nuclear issues, mining issues, and many more. A recognition of the value of science and education is noticiably missing from the national discourse. Scientists and Engineers for America has a nice rundown on the science policies of the two major party candidates. 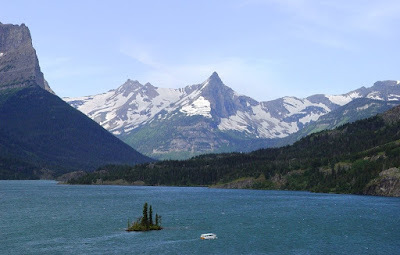 Today's picture is Lake Mary in Glacier National Park. A hundred or so years ago there were 150 glaciers in the park. Now there are 27. They are expected to be gone in the next thirty years due to global warming. Nearly immediate update: Andrew at About.com Geology has a post on the subject from a few hours ahead of me. Check it out here. This month's Accretionary Wedge Carnival is (was) hosted by Callan Bentley at NOVAgeoblog, and is on the rather wide open topic of geologic connections. I'm a little late, having been distracted by the beginning of a new semester: those first hours of excitement, expectation and enthusiasm, followed by fifteen weeks of perceived pain and suffering (at least that is what MY students say). The start of a new teaching year gave me the idea for my contribution to the Wedge this time around. I am a teacher, I was taught by a number of excellent teachers, and they in turn had teachers. I was vaguely aware that some of my professors studied under some illustrious individuals, and I even met a few of them, but I had never really considered looking into the academic lineage of those who taught me geology. I was in for a few surprises. I got my bachelor's degree in geology at Pomona College where I studied under three fine professors, Dr. Donald Zenger, Dr. D.B. McIntyre, and Dr. A.K. Baird. I did my senior thesis with Dr. Baird. He passed away a number of years ago, far too young, but he did a great deal of research on the Southern California Batholith, and worked with Mars Viking Project in the 1970's. To the best of my knowledge, Dr. Baird studied at Pomona College under the guidance of Dr. A.O. "Woody" Woodford (1890-1990), who founded the department in 1922, and taught geology to the likes of Roger Revelle (mentioned in "Inconvenient Truth" for his global warming work; Revelle College at UCSD is named for him), Charles Anderson (former chief geologist of the U.S. Geological Survey), Mason Hill (San Andreas fault and oil on the north slope of Alaska), Rollin Eckis (geologist and former chairman of ARCO), and John Shelton, along with many, many others. Woody maintained an office at Pomona College after his retirement in 1955, and continued his research through the 1980's. He was a familiar sight in the halls when I was a student there. Along with his other professors, Woody studied at U.C. Berkeley under Andrew C. Lawson (1861-1952), a giant in the history of geologic research in both the Canadian Shield and in California. Lawson designed much of the geology program at Berkeley, and made many pioneering studies in the Coast Ranges and Sierra Nevada, and was the chairman of the State Earthquake Investigation Commission that produced the pivotal report on the great 1906 San Francisco Earthquake. Andrew came to Berkeley at the invitation of Joseph LeConte (1823-1901), who was the first geologist there. He is known for many contributions to the field of paleontology, but he is perhaps best known today for his explorations of the Sierra Nevada, and his association with John Muir and the founding of the Sierra Club. While at Harvard University, LeConte studied under Louis Agassiz (1807-1873), who is well known for his work in paleontology, but is celebrated in geology because of his research in glaciology, and his proposal that northern Europe and North America had once been covered by thick blankets of ice. Agassiz was introduced to geology by Alexander von Humboldt (1768-1859) and to zoology by Georges Cuvier (1769-1832). Humboldt traveled widely, especially in South America and Europe, and originally proposed the Jurassic as a name for Mesozoic period represented by limestones in the Jura Mountains. He was one of the first to suggest that Africa and South America might have been connected to each other in the past. Baron Georges Léopold Chrétien Frédéric Dagobert Cuvier was one of the earliest paleontologists and was one of the first to recognize that extinctions had taken place in the Earth's past. He was also a pioneer in the field of comparative anatomy. He is also famous for his belief in catastrophism, which stood in contrast to uniformitarianism, one of the guiding principles of science today. So there it is...a series of connections that reaches back two centuries that led to a lanky slacker at Pomona College who later lucked into being a teacher at a modest community college in central California. It is not the lineage that leads to inspiration, of course. 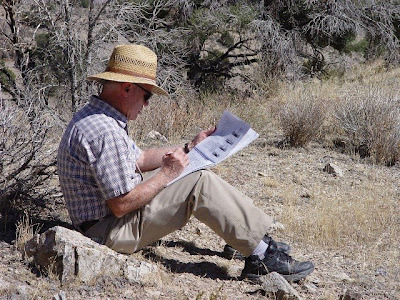 The teacher who gave me the desire to know more about the earth more than any other didn't have a lineage that I can track down on the internet, but I know he loved the science and inspired many of us to become geologists. He's in the picture above, but I haven't asked his permission to give his name, so I won't, but I want to thank him for his contribution to the field, and to let him know that I hope to carry on his tradition of excellence in my own career. As we move forward in time, we reach the geologic period called the Jurassic, one of the few units of the geologic time scale that is familiar to many laypeople. We have Steven Speilberg and Michael Crichton to thank for that, and yes, dinosaurs rose to prominence in the terrestrial landscape, but lots more was going on as well, including a lot of interesting non-dinosaurs, including our own small furry predecessors creeping about in the underbrush (the mammals first appeared in the late Triassic, about the same time as the first dinosaurs). So what are the real Jurassic Parks? In the movies, the park was an island populated by reconstituted dinosaurs that ate people and each other. 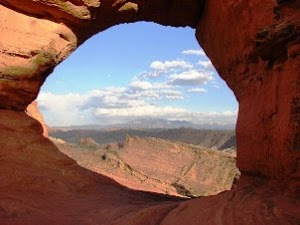 The Jurassic Parks of the Colorado Plateau are the ones in which the most dramatic scenery is provided by Jurassic-aged rocks, which include the Wingate, Kayenta, Navajo, Carmel, Entrada, Summerville, and Morrison formations. 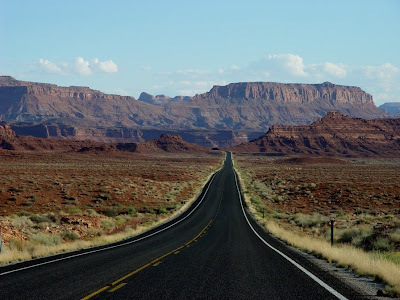 The parks include the familiar Zion, Arches, Capitol Reef, and Canyonlands national parks, and the less familiar Grand Staircase-Escalante, Navajo, Rainbow Bridge, Vermilion Cliffs, and Colorado national monuments. 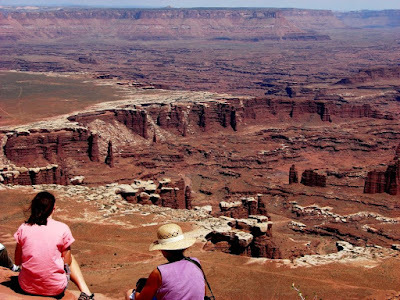 Notable state parks include Kodachrome, Goblin Valley and Dead Horse Point, all in Utah. Many of the dramatic cliffs included within the Glen Canyon National Recreation Area are also made of Jurassic rocks. And let us not forget the actual Dinosaur National Monument, the one that actually has dinosaurs (although at last report, they did not eat park visitors). Today's photos include a parting shot of the Chinle Formation at Petrified Forest National Park, simply because I came across it in a lost file and liked it, and a picture from near the head of the Schafer Trail in Canyonlands National Park, which is cutting across ledges of the Kayenta Formation as it prepares to plunge down the Wingate cliffs to the White Rim, discussed in a previous post. 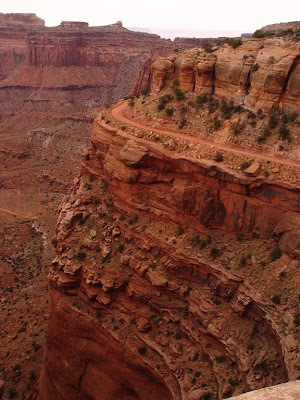 The Schafer Trail leads to the White Rim Trail, which winds for a hundred miles or so through the heart of Canyonlands National Park. It is one of the life-list goals that I haven't accomplished yet. It pretty much requires at least two days to travel, and three or four days by bike. The Schafer Trail was originally carved by cattlemen and improved by uranium miners (they worked pretty hard...). So, why the dramatic colorful cliffs? Something important had changed, causing the Triassic floodplains to disappear. The silts and clays and river channels were replaced by desert dune sands, which quite often form prominent cliffs when hardened into solid rock. The deserts formed because Pangea had begun to break apart, and North America was now moving northwest, into the subtropics where the prevailing air circulation results in dry conditions. We see a similar situation in the Middle East and Sahara Deserts today. I've held a chunk of pure uranium in my hand, and it is simply a piece of metal, and not necessarily dangerous outside the body. But... the unstable isotopes do produce radioactive byproducts, including radon gas. And those byproducts are dangerous, especially in human lungs. But unfortunately, like cigarettes, the effects may not show up for a decade or more following exposure. The longer the exposure, the more likely the bad consequences, mainly lung cancer. The miners in the 1950's worked in poorly ventilated shafts in which radon accumulated at thousands of times the currently established safe levels. They worked in ignorance, because although the danger was suspected decades prior, mine operators and the federal government couldn't be bothered to warn them or provide adequate ventilation. Cold War security concerns trumped safety concerns (it wasn't just the mines; the effects of atomic bomb tests in the southwest have been well-established), and anyway lots of money was being made. Just like cigarettes, the consequences didn't appear for years. But by the 1960's the miners were starting to fall ill and die from lung diseases. Hundreds, who knows, maybe thousands were sickened and killed. But it didn't stop with the miners. So, you've never lived on the plateau, you weren't a miner, so "why, me worry?". Leaving aside the whole contamination of the Colorado River issue, there are unexpected connections. For quite a few years I knew there was some kind of an old mine right on the south rim of the Grand Canyon a short distance west from the El Tovar and Bright Angel Lodge. The rim trail, hiked by thousands every year, takes a long detour around the fenced 10-acre site. I always assumed it was another old copper mine, like others I had seen in my travels. It is and it isn't. It is the Orphan Mine, a turn-of-the-century copper mine in which uranium was later discovered. The uranium was mined from 1953 to 1972. Extraction rights were actually retained as late as 1988 (see the hyperlink above). The site is contaminated with ores and waste. I've heard that the dust-covered miners knocked off work and enjoyed a meal at the lodge before heading home, leading to speculation that geiger counters would have been beeping inside the restaurant. The mine has been shut down for 35 years, so whatever...except for the headline I saw this week, via Arizona Geology. The problem at Grand Canyon National Park is that the park boundary is only a short distance south of the rim. The rest is national forest or Bureau of Land Management and is open to mining. Uranium prices are very high, and interest has been building in a renewal of mining. Thousands of mining claims are being established, and the BLM continues to process requests despite a congressional moratorium; the agency doesn’t consider the Congressional vote valid. At least the Navajo people, as a sovereign government, have the right to block renewed mining. As Kim noted in the comments on my last post, they have placed a moratorium on new development on their lands, and work continues, however slowly, to heal their lands of the damaged caused by Leetso, the Yellow Monster. The Triassic-aged Chinle Formation is well known for a particular resource, and the heritage of the extraction of that resource is a story of tragedy and appalling governmental indifference to the safety and health of its citizens. It is known to the Diné (the Navajo people) as Leetso, the Yellow Monster. The base layer of the Chinle in many places is a conglomerate/sandstone unit called the Shinarump Member. It was laid down in streams and channels cut into a surface of the underlying Moenkopi Formation. Groundwater could flow freely through the unit, and it carried dissolved metals. When the metals encountered carbon rich fragments like wood and plant fossils, the metals precipitated out, forming a yellow powdery mineral called carnotite, or a dark oxide mineral called pitchblende. These minerals are the primary ores for uranium. Uranium has had a long and spotty history. It has the familiar and well-known uses as a source of energy, and in bombs. It has been used as a color source in glazing and glass-making, producing intense green and orange hues, and was even touted many years ago as a health aid. To geologists, uranium is an incredibly useful tool; because it is radioactive, it decays at an extremely regular rate, giving us an accurate method to date the formation of many kinds of igneous rocks (the more familiar term carbon-dating refers to a method of dating archaeological artifacts composed of wood, shell or bone; uranium age dating is far more versatile and useful for geological research). Uranium had been found on the Colorado Plateau prior to World War I, mostly as a by-product of vanadium mining and the search for radium. Today's pictures are of the Oyler Mine in Capitol Reef National Park, which was active in the early 1900's with little recorded production. 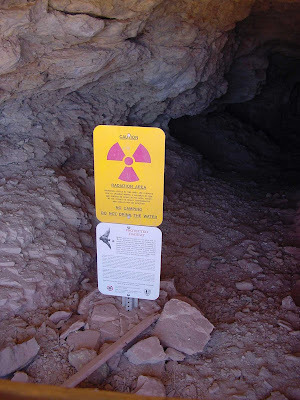 It is a real attention-getter with my students, because we carry a geiger counter when we approach the mine, and it starts beeping within 30 feet or so of the mine openings. The discovery of atomic fission and the development of the atomic bomb in World War II drove the renewed search for uranium on the plateau. The United States was importing something like 90% from foreign sources, and the government deemed it to be a critical resource. In the aftermath of the war, the Atomic Energy Commission sponsored a uranium rush, providing maps, roads, and financial incentives to anyone willing to explore the wildlands of plateau to find the ores. It was a hard and dangerous existence, but several thousand people heeded the call and fanned out over the countryside looking for the elusive yellow powder. One of those involved with the search was Charles Steen. A geologist with a "problem with authority", he arrived in Utah in 1949 with a wife and three small children after a truncated career in the oil industry. Dirt poor, he couldn't even afford a geiger counter. He mortgaged his mother's house to purchase a drilling rig, and using his geological training, he determined that ores might exist in the Lisbon Valley near the Colorado/Utah border just a few dozen feet below the surface. As the story goes, he broke the drill rig short of his goal, but he later found that the drill chips stored in his jeep turned out to be nearly pure uranium ore. In the blink of an eye, he was a rich man and uranium mania swept across the plateau (I suggest the book Uranium Frenzy by Raye Ringholz for a great narrative on the boom). Thousands of people flooded into the region, changing it forever. More than a thousand mines were drilled, uranium processing facilities were built, bombs were made and exploded, and a vast amount of money was made (and lost). America had entered the atomic age, with her bombs a hedge against the frightening communist threat (except they got the bomb too), and the promise of safe, clean atomic energy so cheap it wouldn't have to be metered. But as always seems to be true, the dreams didn't exactly match the reality. Tsoodzil, near Grants, New Mexico, is one of the four sacred mountains of the Navajo people. The Europeans called it Mt. Taylor. One of the biggest uranium discoveries took place on and around the mountain, and one of the largest underground mining operations plumbed the depths beneath the mountain. No one consulted with the Navajo or any other Indian nations over possible cultural objections, because, of course, national security overrode all other concerns. Thousands of miners labored under the ground in the poorly ventilated tunnels. But, there was money to be made after all. But an evil had been released, and few of the people involved would be aware of it until it was too late. When an evil act is done, many monsters are born of that act. Our traditions tell us that the monsters of the past were created when people transgressed, when they committed evil. The other monsters are a war industry built on disrespect for human life, and a modern international energy industry built on disrespect for both other humans and the environment. Those monsters feed on power, political power as well as nuclear power. Their nourishment comes from disrespect for the five-fingered People (i.e., humans) and for Mother Earth. Continuing on our journey through time on the Colorado Plateau, we explore the Chinle Formation, one of the most diverse and distinctive layers in the region. 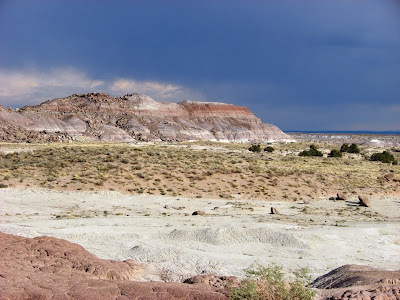 It forms most of the scenery at Petrified Forest National Park, and is ubiquitous in such widespread locales as Capitol Reef and Canyonlands National Parks, Grand Staircase-Escalante National Monument, Zion National Park, and Glen Canyon National Recreation Area. The formation was laid down during the late Triassic, a time of huge changes in the world, especially in the biosphere. It was the age of the earliest dinosaurs, but the world was populated by a host of unusual reptiles and amphibians. 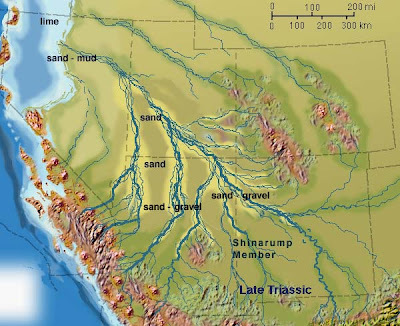 The Chinle was an ideal environment for preserving fossils: the shales, siltstones, sandstones and conglomerates were laid down in river floodplains and channels. The headwaters of the rivers were mountains far to the southeast, but a chain of volcanoes to the southwest provided vast amounts of ash to the landscape. When the Chinle is sandwiched between cliff-forming layers, it forms distinctive lavender and red slopes, but is often covered by debris from the cliffs above. In parts of the Navajo Reservation and the region around Holbrook (known popularly as the Painted Desert), the Chinle forms spectacular badlands topography. The bright colors result from the oxidation of various metal ions in the clay layers, especially iron. 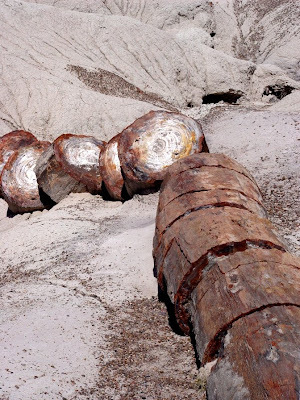 The trees of the Petrified Forest are the most famous fossils of the Chinle. Most of the trees accumulated as logjams in the large rivers that flowed northwest through the region. Some of the logs are as much as 100 feet long. Once buried in mud and ash, silica dissolved from the surrounding rock filled cell spaces or replaced the wood material entirely. Once again, metal oxides provide the striking colors, primarily reds and yellows. It is pretty amazing that any petrified wood remains in the park. In the early part of the century, trains would stop nearby so people could carry off samples. At least one mining venture sought to grind the wood up into abrasives. Every year park visitors carry off more, but I notice that the National Park Service doesn't discourage the rumor that bad luck befalls those who steal wood. Ironically, people pay huge fines for stealing something that can be picked up free and legally outside the park. Some of the local rock shops even give away free samples. The Chinle Formation also contains a rich vertebrate fossil record. Phytosaurs and metoposaurs are commonly found, as well as Coelophysis, one of the earliest carnivorous dinosaurs. Hundreds of their remains have been discovered at Ghost Ranch in New Mexico. Plateosaurus and Chindesaurus are two relatively small ancestors of the giant sauropods that dominated the later Mesozoic. A rich assemblage of other fauna and flora have been discovered. 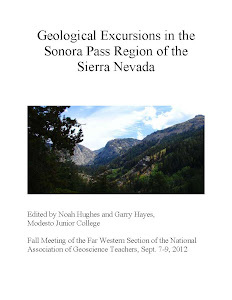 A nice review of the paleontology of the Chinle can be found here. The Chinle has another heritage, a far more insidious one...our next post will explore this in more detail. Mid-week Mystery Sample: What is it? Heck if I actually know! Well, that just beats all. We community college instructors often revel in the fact that we know a little bit about a lot of things instead of a lot about some specific things, but sometimes it helps to actually know a lot. 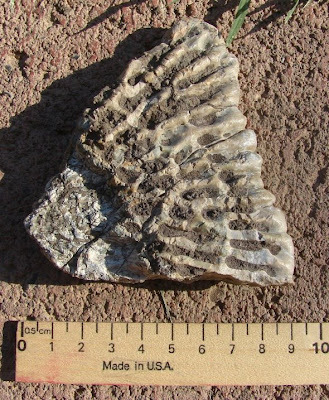 Back when we found the mystery sample of the Chinle Formation, we wondered if it was a coral, and how a coral could have gotten into the Chinle, which is a terrestrial formation. 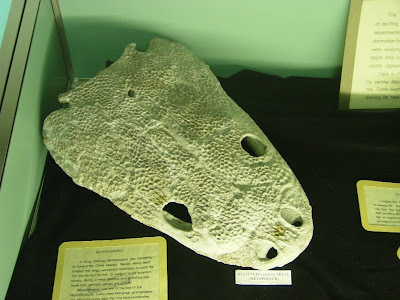 As I described in the previous post, I thought I had discovered the answer to the mystery when I saw a metoposaurus in the visitor center at Petrified Forest National Park (shown in the photo above), given the unique pits in the skull plates. The metoposaurs were large carniverous amphibians. I couldn't exactly make my sample line up with any particular part of the skull, but it was an adequate answer for me, the non-expert. In the best tradition of bad science, I didn't continue to explore other hypotheses once I had an answer that satisfied me. That's the kind of attitude that drives me nuts when my students are trying to identify rock and mineral specimens ("it's clear so it must be quartz, even if it cleaves"). Of course, running a blog demonstrates your ignorance to anyone who wants to pay attention, so I say thank you to an actual paleontologist, Jerry Harris, who suggested my sample could also be a phytosaur scute. So I am properly chastised for not covering my bases (y'all notice I could have said I knew it was a phytosaur all along....). I am at the same time happy to find that I might have a piece of phytosaur. They were one of the fierce predators of the Triassic: somewhat crocodile shaped, up to 30 feet long, and overall pretty cool. Mid-week Mystery Sample: What is it? So what is it? 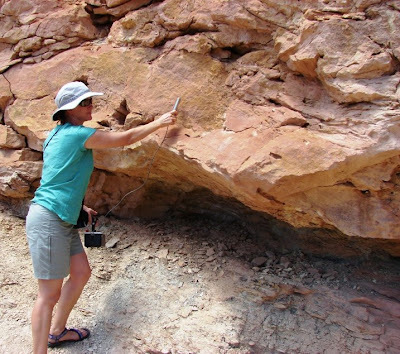 In the early 1990's, I was conducting one of our first field trips through the Colorado Plateau region, and at a stop to observe the sediments of the Chinle Formation, one of the students picked up the sample seen in the picture. I am admittedly not a paleontologist, but I looked and looked and couldn't make heads or tails of it. It sat on my desk for seven or eight years, until I walked through the visitor center at Petrified Forest National Park (the park is a showcase for the Chinle Formation), when I got it! Can you? The first period in the Mesozoic Era is the Triassic, which lasted from about 245 to around 200 million years ago. The world's continents had been combined into the supercontinent Pangea, and the biosphere had just been subjected to the worst extinction event ever recorded in earth history, with something like 95% of all species wiped out. It is as if the world were starting over, with a new cast of characters, and new landscapes. In the Colorado Plateau region, two formations were laid down: the Moenkopi Formation, and the Chinle Formation. The Moenkopi was formed in river floodplains and shallow lakes, the shales and sandstones stained bright red by iron oxides. Distinctive ripplemarks, channel deposits, and mud cracks attest that the environment was in turns wet and dry, under either arid or subtropical conditions. The source of the sediments was from mountains far to the southeast, sloping towards a northwest shoreline near present-day Nevada and western Utah. Numerous trackways attest to the presence of numerous small reptiles and amphibians, but bones are rarely preserved. Great places to see the Moenkope? Try the western and southern part of Zion National Park, the basal cliffs of Capitol Reef National Park, at Cliff Dwellers near the Navajo Bridge downstream of Glen Canyon Dam, the region near Tuba City and Moenkopi, and along the Colorado River near Moab, Utah, which is the subject of today's photograph. I am kind of cheating with today's picture. 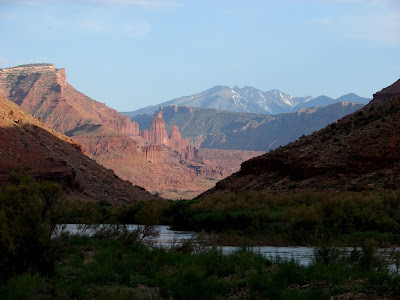 It shows the Fisher Towers along the Colorado River near Moab, Utah, along Highway 128. The La Sal Mountains form the backdrop. The Moenkopi Formation is in fact visible in the picture, but only as the darker tops of the towers, and the red slopes to the left. I consider this road to be one of the most spectacular drives in North America, especially in the evening light. I just happen to really love the picture and was looking for an excuse, any excuse, to use it! Sort of a follow-up to the previous post...here is a National Park Service diagram of the Grand Staircase (click on the image to enlarge). The image has been a popular poster in the National Park Service Bookstores for years, and I was pleased to find it on Wikipedia. Highly Allochthonous made a great point the other day when he commented about how easily we geologists can confuse laypeople when we start describing geological periods and eras without noting the actual years in which the events took place. I am taking advantage of a time scale that Chris provided on his website, and have added to the page elements to the left (scroll down). I hope it clears up any confusion! I have enjoyed exploring the Grand Canyon on this blog over the last few weeks, using the incredible gorge as an introduction to the history of a unique corner of North America, the Colorado Plateau. A layperson could be forgiven for thinking that the history of the world is written in the walls of the Grand Canyon given the rich story told by the rocks there, but there are many parts of the story missing. So Geotripper is going to hit the road and start exploring some other corners of the Plateau country. We will return later to the Grand Canyon because we still have not explained how the canyon itself developed, but that is actually one of the last events in the history of the region. What is it that is missing from the story? Well, imagine this: standing on the rim of the Grand Canyon, you can look down and see nearly 2 billion years of earth history in the mile of cliffs below you. Now, look up. Today you see only sky and clouds...but not that long ago there was at least another mile of sediments covering this landscape. Another mile! These rocks recorded the Mesozoic and Cenozoic history of the region, the 245 million years leading to the present day. Putting it another way, the entire history of the dinosaurs, the birds, and the mammals. How do we know they were there? The Mesozoic rocks are found north and east of Grand Canyon, sitting on top of the Paleozoic rocks. The most striking exposure is a series of cliffs visible from the Kaibab Plateau north of Grand Canyon long known as the Grand Staircase. Named for the dominant color of each of the cliffs (the Pink Cliffs, the Gray Cliffs, the Vermilion Cliffs and so on), the region includes several famous national parks (Zion and Bryce Canyon), but also some less familiar national monuments and state parks (Grand Staircase-Escalante NM, Kodachrome State Park, Coral Pink Sand Dunes State Park and others). Our next post will look at the world of Pangea and the Triassic Period. Some very strange animals are coming up. With today's post we reach the rim of the Grand Canyon, and the end of the Paleozoic rocks of the Colorado Plateau. But these pictures are not of the Grand Canyon, although some similarities exist. Both canyons were carved by the Colorado River, for instance. We are in southeastern Utah at Canyonlands National Park. Our vantage point is the Island in the Sky plateau that overlooks the confluence of the Green and Colorado Rivers. Unlike the Grand Canyon, the oldest rocks visible are Permian in age, and the upper canyon walls are in Mesozoic rocks (the age of the dinosaurs, basically). Hikers in the Grand Canyon who have a geological background don't measure their progress in miles and feet the way normal people do. We note our location by the strata through which we are strolling. The base of the Supai Group means a long slog through red dirt. The base of the Redwall almost always means a tough climb is ahead. The greatest relief to geological hikers is to arrive at the top of the Coconino Sandstone, where we realize that only two more formations lie between us and a cold beer or iced tea: the Toroweap Formation and the Kaibab Formation. Both are easily visible in yesterday's post, the Toroweap as the forested slope above the sheer Coconino cliff, and the Kaibab as the ledgy cream-colored cliff forming the rim of the canyon. Like the Coconino, both formations are Permian in age, the very latest part of the Paleozoic Era. 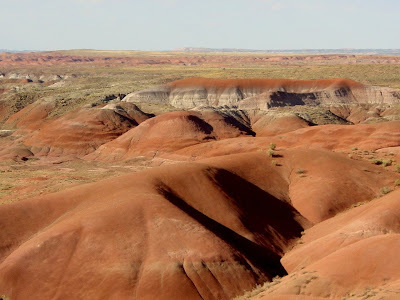 The Toroweap Formation is rather variable in composition, ranging from dune sands, evaporites (forming in drying bodies of water), and limestone. It formed in a time of changing sea level, where the shoreline transgressed and regressed repeatedly, forming dune fields, tidal flats and sabkhas (coastal salt flats). Fossils are generally rare, given the harsh conditions in which the rocks formed. 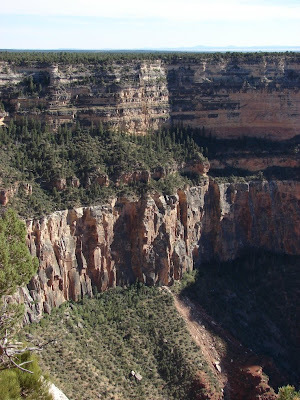 The Kaibab Formation is more marine in origin, being composed of limestone, dolomite, and sand. In many places chert nodules can be found. The chert is a form of altered quartz that can develop long after deposition. The layer is rich with fossils: crinoids, brachiopods, sponges, bryozoans, shark teeth, nautiloids, fish, and some of the last trilobites to inhabit the earth (the Kaibab Formation on the North Rim of the Grand Canyon was the site of my first childhood fossil discoveries). Many of these species were doomed: the end of the Permian was marked by the worst mass extinction event ever recorded. Something like 95% of all the species on the planet disappeared, for reasons that have not yet been determined, although many hypotheses are proposed. 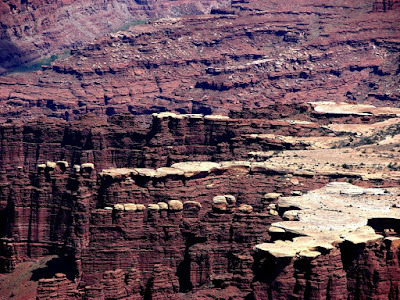 So why the pictures of Canyonlands National Park? Note the white rock layer sandwiched between thick layers of red rock. This layer is appropriately called the White Rim Sandstone (the White Rim is a very prominent terrace in Canyonlands), and being Permian in age, is related to the Coconino, Toroweap and Kaibab formations. The sea that formed the Kaibab and other late Permian marine layers transgressed from the west onto the continent. This is indicated in part by greater thicknesses to the west. On the other hand, the farther east and north that one travels, these layers become thinner. And thinner. By the time we reach Canyonlands National Park, the marine sands are only a few feet thick and then pinch out. We are looking in these photographs at the last beach of the last Paleozoic sea. Time Beyond Imagining - A Brief History of the Colorado Plateau: Sand! Back to our adventure through time on the Colorado Plateau. We have been mostly exploring the Proterozoic and Paleozoic history with a walk up from the bottom of the Grand Canyon where these rocks are so spectacularly exposed. There have been some side excursions to the Paradox Basin and the Ancestral Rockies, but today we reach the rim of the canyon, with a short exploration of the final three formations that make up the canyon walls (in two posts). One of the most obvious layers in the Grand Canyon is a 300 foot high white cliff just a few hundred feet below the rim. The rock making up the cliff is the Coconino Sandstone, which formed in Permian time as sand dunes in a desert that extended across northern Arizona, New Mexico, and southern Utah (something like 200,000 square miles). The most obvious feature of the formation are the crossbeds, the sloping layers that represent the slip faces of the dunes that have been preserved in the cliffs. It is a beautiful rock formation! When I was a new student taking my first or second class in geology, I had the opportunity to visit the Raymond Alf Paleontology Museum at Webb School in Claremont, California. I was intrigued by their spectacular collection of fossil trackways, and was curious where such ichnofossils were found. One of the sources was the Coconino Sandstone, which I would see up close only a few weeks later on my first geology field trip. There is nothing quite like finding a fossil trackway like the one illustrated above. 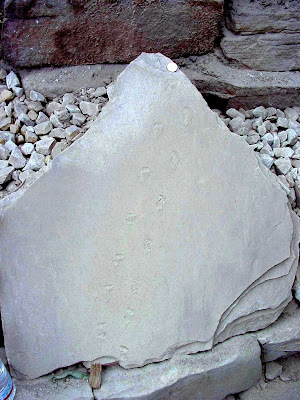 Unlike fossil shells and bones, representing death, a trackway preserves a moment in the life of a creature. Was it running or walking, feeding or escaping? What kind of creature was it anyway? The Coconino preserves more than two dozen kinds of tracks, from large amphibians or reptiles to scorpions or spiders. The Coconino is correlated with the De Chelly Sandstone, which forms the spectacular cliffs of De Chelly National Monument, and the wonderful John Wayne movie towers and spires of Monument Valley. Because the sand is porous, it is an important groundwater reservoir for towns to the south of Grand Canyon like Flagstaff and Williams. John Shelton passed away on July 24th at his home in La Jolla, California. If you have been following my blog from early on (the olden days of January 2008), you will know that I am thrilled by plane rides, and the unique perspective that aerial photographs add to one's understanding of geology. I haven't talked much about why I feel this so strongly. I didn't get to fly much as a child and teen, but I lived in southern California, and I was surrounded by high mountains: the San Gabriel and San Bernardino Mountains were only a short drive away, the Sierra Nevada and the Mojave Desert just a little farther. My favorite weekends were those spent climbing mountains that gave me a view. If I was stuck at home, I climbed to the very top of a deodar tree in my backyard that gave me a look at the surrounding neighborhood (I thought as a child that it must have been 50 feet high, it was more like 20...). When I took my first geology class in 1975, I was introduced to the perfect book that would feed my mania for high places: Geology Illustrated by John Shelton, published in 1966. 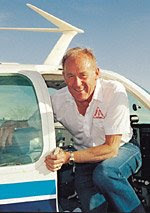 Shelton was a great teacher, a pilot, and a photographer. If the teachers among you have ever shown a slide with an aerial view of a geologic feature, there is a good chance that he took the picture. His set of 400 aerial photographs is still sold in geoeducational catalogs. His book, despite being out of print for decades, is considered one of the 100 most influential books in science for the last century by American Scientist. Get it if you can at the used bookstores or online, it is priceless. My dog-eared copy is one of my single most treasured books. John was a graduate of Pomona College (in 1935), and received his PhD from Yale in 1947. He taught at Pomona College from 1945 to 1960, and then he served as a scientific advisor for the American Geological Institute from 1962 to 1974, developing a series of scientific films with Encyclopedia Britannica. If you remember seeing "Beach: River of Sand", "Why do we still have Mountains? ", "How Solid is Rock?" and lots of others, you were also influenced by Shelton's contributions to the geological sciences. In retirement, he assisted in the development of the "Earth Revealed" telecourse series. As a young student at Pomona College, I had a single opportunity to meet Dr. Shelton, and we corresponded a bit when I began searching for a geological career. I appreciated his assistance, but I can barely imagine any books that were more influential in defining the direction of my own career, and as a teacher, his pictures are one of my most valuable classroom resources. I offer my condolences to his family, and I want them to know how much I appreciate his contributions to the geological sciences, as well as the inspiration he provided in the direction of my life. More information about John Shelton can be found here, or here , and info on the exhibit of his photography at the San Diego Natural History Museum can be seen here (through November 2).